The restaurant and café business is often based on reputation, so making sure your business has a high rating is of critical importance. See what guests think about their experience at your restaurant by letting them fill out this short survey. From questions on food service to affordability, our restaurant feedback survey gives you new insights into your restaurant’s performance and what you can do to grow your business. To customize this template after signing up, choose ‘Restaurant Survey’ as example when creating a new survey. Clearly determine what you want to achieve with your survey. Aside from the usual goals like identifying operational problems or learning about customer satisfaction, you might want to ask questions like why customers chose your restaurant or how they first heard about you. Knowing what you want will help you strategically shape your questions best fit to achieve your goal. Use concise, simple language. Avoid unfamiliar words as much as possible. This will prevent wrong interpretations and skewed results. Offer an incentive. Giving your guests an incentive to complete your survey can increase response rates by up to three times. Something like a free dessert in your restaurant or a discount on their next visit can be quite effective. You are then providing them value on top of the commitment they already made. Keep your survey simple. Make sure your respondents don’t get tired while filling in your survey. A good survey takes less than 5 minutes, any longer than that your drop-off rate rises significantly. Why use Survey Anyplace as Restaurant Survey tool? Advanced skip logic lets your customer take the quickest route through the survey by only showing questions that apply to them. Gather information from your customer on their device of choice with our responsive design. Advanced design options make sure your surveys match your brand perfectly on every device, whether it’s your customer’s mobile phone or your own tablets. Use your customers’ language. Make them smile by adding audio and video into your survey. It’ll all add up to a more engaged person willing to share more with you. Custom colors, icons, and formats make sure your survey matches your restaurant’s brand. For more advanced branding option, check our white label solution. 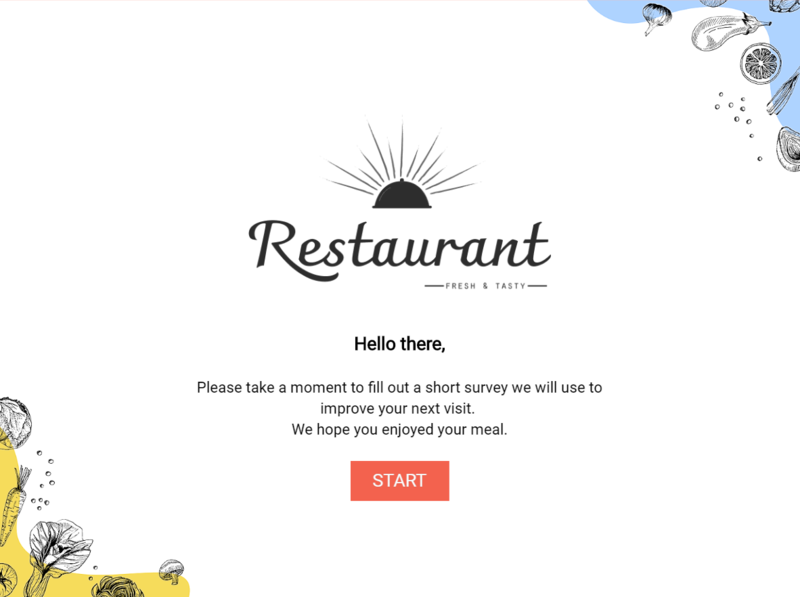 To use this sample restaurant survey, sign up for Survey Anyplace , and choose ‘Restaurant Survey’ as template when creating a new survey. It is important that the data can be recorded efficiently and that it is easy to analyze: Mobile devices such as a tablet or smartphone are ideally suited for this. Our tool is equipped with a mobile-optimized interface which will ensure user a user-friendly experience. This can also be done by paper forms but carries the disadvantage that the data still needs to be uploaded to a computer and this is a tedious, error prone task. Looking for more marketing templates and examples? Improve your customers' experience and optimize your restaurant to achieve the highest of standards.